#0311 – SQL Server – Database files upgraded from version nnnn to mmm – why databases cannot be restored backwards? I’m restoring the backup of an existing database. During the restore, the Results pane in the SQL Server Management Studio displays the following message. Am I doing anything wrong? Converting database ‘FileVersionUpgrade’ from version 661 to the current version 706. Database ‘FileVersionUpgrade’ running the upgrade step from version 661 to version 668. Database ‘FileVersionUpgrade’ running the upgrade step from version 705 to version 706. This message is perfectly normal and simply indicates that the database being restored was backed up in a version of SQL Server that has a major version (e.g. 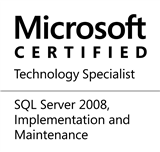 major version of SQL Server 2008 is 10, that of SQL 2012 is 11 and so on) different from the one to which it is being restored or is on a different patch level. In fact, the database files have an underlying structure that is unique to the version of SQL Server (major versions may also have major changes to the file structure). When a database is restored, SQL Server upgrades the underlying file structure step-by-step from the supported source version to the destination version – which are the informational messages that are seen on the SSMS Messages tab. The upgrade in the internal file structure is also the reason why a database backup taken on a newer release/patch level of SQL Server cannot be restored on a previous release/patch level of SQL Server. This entry was posted in #SQLServer, Blog, Imported from BeyondRelational and tagged #SQLServer on December 16, 2013 by nakulvachhrajani.